If you've been trying to figure out how to better work collaboratively with coworkers, Microsoft has a new tool for Office 365: Groups. As the name suggests, the Outlook Web app's Groups feature allows you to form ad hoc groups of different members of your team—sales, for example, or a cross-organization tiger team created to oversee a new project deployment. Microsoft continues to add collaboration features to Office, beginning its rollout of a new Groups feature to allow small teams to better work together. As the name suggests, Groups allows you to form ad hoc groups of different members of your team--sales, for example, or a cross-organization tiger team created to oversee a new project deployment. 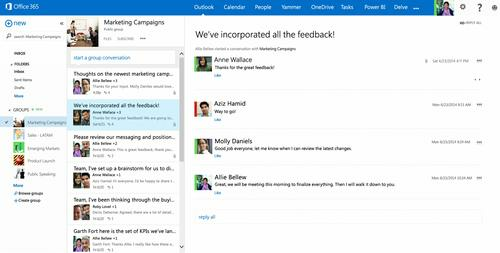 Outlook generally allows you to create shared calendars by emailing invitations and so on; Groups promises to accomplish this more quickly and efficiently. But the real advantage, it seems, is in sharing files. "[O]ften times the tools we use to bring people together are different in each app--distribution groups in Outlook, buddy lists in Lync, groups in Yammer," Jared Spataro, the general manager of enterprise social at Microsoft, wrote in a blog post. "That's why we're introducing Groups in Office 365, so you can easily connect with the colleagues, information and applications you need to do more." But as Spataro notes, there's already a surplus of collaboration tools and workflows that Microsoft provides--and, chances are, people have their preferred methods and are loathe to give them up. Groups, then, are a way to help get Microsoft users back on track in a consistent workflow that Microsoft can improve upon over time. The one potential drawback that I can see is the reliance on web apps; within PCWorld itself, we have editors who rely exclusively on Outlook's web app, and others who prefer the desktop application. Until Microsoft can rectify those two different platforms, some Office workers aren't going to fully benefit.